A study published in the January issue of the Annals of the American Thoracic Society examined data gathered in the National Health and Nutrition Examination Survey. They found that of the people who consumed the most fiber, — more than 17.5 grams of fiber daily—68.3% had normal lung function and that only 14.8% had airway restriction. In comparison, of those who consumed the least fiber—less than 10.75 grams—50.1% had normal lung function and 29.8% had airway restriction. The researchers cite fiber’s ability to combat inflammation and regulate the gut microbiome as the source of the possible health benefits. Researchers surveyed over 1,100 Crohn’s Disease sufferers about the behavior of their disease and their diets. From the data that they collated, they were able to determine that patients were approximately 40% less likely to have a disease flare up when they did not avoid high-fiber foods compared to those that did. In general, Crohn’s Disease sufferers who consumed the most fiber were the least likely to have flare ups period, according to the research published in the December 2015 issue of Clinical Gastroenterology and Hepatology. According to a story published in the Washington Post, Under Armour—the athletic apparel company—looked at data from 427,000 of its MyFitnessPal app users who lost weight. Those who came closest to their weight-loss goals showed nearly identical data when compared to those who did not achieve optimum weight-loss results: similar calories consumed, protein, fat, carbs and exercise. The only difference, those who slimmed down most ate about 29% more fiber. The AIM Companies provides fiber through two amazing supplements: Herbal Fiberblend and fit ‘n fiber. Both are effective ways of adding fiber to the diet to aid with weight management and digestive health. They can be combined into one potent super-fiber formula that tastes fantastic! In April, we celebrate our planet and the diverse and abundant organisms (like us) that are living well thanks to the goodness and bounty of the natural world. So when selecting wholefood nutritional supplements, the first thing you want to do is to make sure that whatever you choose comes direct from nature and doesn’t contain harmful chemicals that can pollute your body. The AIM Companies knows this. That’s why we only use plants that are tested for the absence of over 300 pesticides, herbicides, fungicides and other harmful chemicals. The USDA reports that 50% of foods that are labeled “organically certified” still contain chemical residues. Our Quality Assurance Department will reject any ingredients that test positive. The AIM Companies goes above and beyond to ensure that you receive the highest-quality, healthiest wholefood products and nutritional supplements. If you’re feeling worn out or if you’re walking around all day in a haze, if you feel bloated, constipated or congested, if you get sick more often than normal or have worsening allergies, it could be due to a toxin buildup. Your body works hard at removing toxins through organs like the liver, lungs and kidneys, but if you’re eating too much fat, sugar and meat, toxins can begin to accumulate rapidly and may be a real nuisance to your wellbeing. Luckily, there are quite a few nutritional strategies for detoxifying. Fiber is one of the best nutritional tools for cleansing. Sometimes toxins and other gunk can accumulate inside the walls of your intestines which can prevent you from absorbing valuable nutrients. A healthy dose of deep-cleansing fit ‘n fiber or Herbal Fiberblend may be able to help keep your digestive system running smoothly and your intestine walls gunk- and toxin-free. The lymphatic system is an often overlooked but highly essential part of the immune system. It acts as a filter for the body’s ubiquitous interstitial fluid, and it also transports fats and vitamins. Herbal Release is the pinnacle of lymphatic cleanses. The gut does more than digest food. It’s also home to a wild environment unlike any other on the planet, the gut microbiome. And it is estimated that 70% of our immune system is housed in our midsections. All those unpleasant, aforementioned toxin-bringers (sugar, fats, meat, etc.) and things like stress and illness can wreak havoc on your internal environment. That’s why a probiotic like FloraFood is so important. It restores balance to your body by promoting the growth of healthy, natural gut bacteria. The World Health Organization estimates that over 1 million people die each year from the effects of air pollution. Most of those deaths and many related health problems can be tied back to oxidative stress. High levels of oxidative stress means that your body is out of balance. When pollution is high, the body becomes inundated with free radicals and cannot produce enough antioxidants to fend them off. That’s why it’s important to reach for an antioxidant supplement like Proancynol 2000 or a wholefood product with a high ORAC score like BarleyLife. Each contains the building blocks of free-radical protection that your body can use to defend itself. Air pollution has also been linked to endothelial dysfunction dysfunction (aka dysfunction of the veins), and pollution caused by heavy traffic has been shown to increase blood pressure and decrease blood flow. Scientists tested beet juice to see if it would help to mitigate this phenomenon. When people drank beet juice, their blood flows were unhampered and improved. You can obtain your daily dose of dietary nitrate from Red Rush or RediBeets. A study published in Epidemiology looked at subjects who suffered from chronic obstructive pulmonary disease (COPD). On days when the air pollution levels were highest, their symptoms were the worst and many were admitted to the hospital. However, if they had low levels of vitamin C, the chances of a COPD sufferer ending up in the hospital was 1.2 times greater, leading researchers to believe that vitamin C’s antioxidant properties offered some protection against the pollution. And you can find vitamin C in Peak Endurance and BarleyLife Xtra. Although humans, animals and all the plants need sunlight to survive, too much of a good thing can be a bit dangerous and unpleasant. That’s why it’s important to be responsible about soaking up those vitamin D-filled rays. One nutritional tip for keeping your skin healthy and young in the sun is through the use of omega-3 fatty acids. Sun damage can cause wrinkles, and omega-3s may help reduce inflammatory compounds that speed up the wrinkling process. Get your essential fatty acids from AIMega. There’s been a real bulk of fiber news these past few weeks. It’s been linked to a healthier gut, a lower risk of lung disease, fewer Crohn’s disease flare ups, and it has also been found to help with weight loss for the umpteenth time. The latest study discovered that women who ate more high-fiber foods during adolescence and young adulthood had a significantly lower risk of breast cancer. If a large percentage of fiber came from fruits and veggies, then the better their statistical likelihood. Harvard researchers used data gathered from the 90,000+ women surveyed for the Nurses’ Health Study II. The healthcare professionals who participated in that large-scale, long-term study were asked to report their diet over a number of years. Other factors like genetics and environment were also figured in. After sifting through the data, the researchers were able to determine that women who ate more dietary fiber in their young adulthood had a 12%-19% lower rate of breast cancer during that time. Women who consumed more fiber during their adolescence had their overall risk lessened by 16% and a 24% decreased risk of contracting the illness prior to menopause. Each additional 10 g of fiber eaten during adolescence seemed to reduce the risk of breast cancer by 13%. The study stresses that those who ate the most fruits and veggies saw the greatest benefits. Researchers attribute these findings to fiber’s ability to diminish high estrogen levels which have been linked with breast cancer. The study was published in the February 2016 issue of Pediatrics. Although everyone should increase the amount of fruits and vegetables they eat, it doesn’t hurt to reach for a bit of all-natural supplemental fiber like Herbal Fiberblend or fit ‘n fiber. It’s a low-calorie way to feel fuller longer, ease digestion, and it’s been linked to heart health as well as overall wellness. The new formulation will use the same general base as the original peach formula with a few small modifications. These changes have been made to ensure our new product is healthier and more consistent with AIM’s philosophy. First, we’ll be using brown rice syrup solids, a glucose-based sweetener from rice starch that contains absolutely no fructose. This replaces the evaporated cane juice in the original formula. We also removed Fibersol-2 and replaced it with acacia fiber. Secondly, we’ve removed all the inulin from the new product. Although inulin provides prebiotic benefits and increases mineral absorption, it is also widely associated with bloating, cramps, stomach pain and gas. In-house trials have determined that the inulin-free peach fit ‘n fiber does not cause these side effects. Instead, we have added konjac fiber known for its ability to help regulate blood sugar, suppress appetite, aid in cholesterol management, reduce diabetes risk and decreases constipation. For those of you who like the apple-cinnamon, we will keep the gluten-free oat fiber in the new peach formulation. The oat fiber was a favorite among Members who liked the last iteration of fit ‘n fiber, and we’re hoping that by retaining the oat fiber, we’ll also retain applecinnamon fans. But one of the biggest reasons that the Members requested the return of peach fit ‘n fiber is because it mixed so well with Herbal Fiberblend. As you probably know, Herbal Fiberblend is one of our top sellers due to its consistency, history and potency. It is, however, an acquired taste. Many of our Members mixed the original peach fit ‘n fiber with Herbal Fiberblend to create a drink that provided a heaping serving of dietary fiber, the unique blend of herbs only HFB can provide and the great taste of peach. We believe that these two products combined can change lives for the healthier and grow AIM businesses all around the world. Irritable bowel syndrome affects a significant segment of the population (around 15%). The underlying cause or causes of IBS is unknown, but it often manifests in a variety of symptoms like cramps, diarrhea, gas, bloating and constipation. To complicate matters further, each sufferer’s symptoms can be triggered by any number of factors specific to the individual. That means a nutritional strategy has to be self-tailored, possibly under the watch of a healthcare professional. We will examine what experts are saying about nutrition for IBS as well as some of the latest research. The International Foundation for Functional Gastrointestinal Disorders calls fiber a double-edged sword because some IBS sufferers may experience gas or bloating after use. However, they also add that almost every IBS sufferer would likely benefit from a moderate fiber increase. The IFFGD recommends gradually increasing fiber intake until reaching 20-35 grams per day (based on the individual’s recommended dietary allowance). There is evidence that probiotics which contain Bifodacteria may alleviate or reduce some symptoms of irritable bowel syndrome. There is a caveat to this, however. In terms of IBS, it is less about just taking a probiotic and more about gut-flora manipulation. Some people found relief from IBS by taking antibiotics which kills gut flora, and others have benefited by gradually changing the landscape of their gut biome over time. Digestive enzymes like amylase, lactase, protease and lipase help break down food, making digestion easier. There have only been two small studies on digestive enzymes and IBS. Both have been positive. One study found that enzymes improved post-meal IBS symptoms. The other showed that enzymes helped relieve gas and bloating. Dr. Carolyn Dean wrote The Magnesium Miracle. She also, conveniently, wrote IBS for Dummies. In her works, she explains that magnesium taken orally can have a laxative effect, helpful for people whose IBS has made them constipated. However, if a person suffers from IBS-related diarrhea, he or she can use a topical magnesium on the skin to reap magnesium’s benefits without upsetting the stomach. There is evidence that short-chain carbohydrates (aka fermentable oligo-saccharides, si-saccharides, mono-saccharides and polyols) can aggravate IBS because they tend to ferment in the gut and cause gas. That is why many IBS sufferers choose to follow a low-FODMAP diet. You can find a complete list of low- and high-FODMAP foods here. Spicy foods, sugary foods and caffeine can be problematic as well. AIM offers nutritional supplements that can fit into a low-FODMAP diet as well as digestive enzymes, probiotics, fiber and topical magnesium. But in the case of IBS, you should consult a medical practitioner before making any drastic dietary changes. This post is for education purposes only. Calories from high-fiber foods have been called “smart calories” because high-fiber foods such as vegetables, fruits and whole grains tend to be healthier and because fiber fills you up and keeps you feeling full. Likely due to those reasons, a recent study has shown that a high-fiber diet is almost as effective as a calorie-restrictive one in terms of weight loss. However, a new study on mice published in the American Journal of Physiology—Gastrointestinal and Liver Physiology shows that fiber may affect body weight in an entirely new and different way. Mice fed a diet low in soluble fiber gained weight and had more body fat when compared to mice fed a diet that included soluble fiber. Researchers believe that the mice gained that weight because soluble fiber is essential for a healthy gut microbiota. The lack of soluble fiber contributed to inflammation in the intestines and poor gut health, and these factors were thought to be the underlying factors that contributed to the weight gain. After just two days without soluble fiber, the soluble-fiber-deficient mice’s intestines became shorter and their intestinal walls became thinner! Without soluble fiber, it seems that the gut flora were unable to produce a sufficient quantity of short-chain fatty acids that the intestinal cells need to make energy. These short-chain fatty acids also have anti-inflammatory properties. When the mice were once again given soluble fiber, their guts returned to normal and the inflammation disappeared. 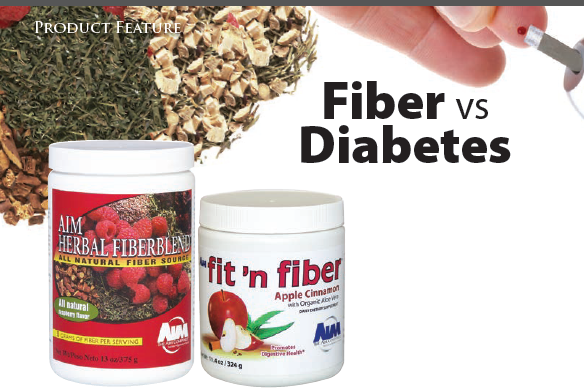 AIM offers fit ‘n fiber and Herbal Fiberblend for all your soluble and insoluble fiber needs. In 2010, the number of Americans who suffered from diabetes was 26 million. Now health experts believe that number may be nearing thirty million. A whopping 86 million—that’s one third of the US population!—have a condition known as prediabetes, higher than normal blood sugar but not high enough to be classified as fullon type 2 diabetes. Prediabetics will likely develop diabetes if they do not make changes to their diet and exercise habits. The Centers for Disease Control predicts that one third of prediabetics or over 28 million people who don’t make healthy changes will develop type 2 diabetes within five years. One simple, healthy change that a diabetic or prediabetic can make is to increase the amount of fiber in their diets. And yes, fiber is a carbohydrate and is usually included in a food’s total carbohydrate count. However, fiber does not add to blood sugar because fiber is not broken down by the body. Fiber has been shown to help people with diabetes because it slows the absorption of sugar thereby improving blood sugar levels. Earlier this year, researchers in Europe examined information gleaned through the EPIC-InterAct, the world’s largest study of type 2 diabetes that followed 350,000 people (12,000 diabetics in that group) for eleven years. They found that people who consumed more than 26 grams of fiber per day were 18 percent less likely to develop diabetes when compared to those who ate only 19 grams. The researchers then compared the data from the Epic-InterAct with eighteen other large-scale studies from all over the world. They found that for every 10 grams of fiber a person ate, his or her risk of diabetes dropped by 9 percent. Another factor to consider is fiber’s ability to improve satiety. The more fatty tissue a person has, the more resistant they become to insulin. Obesity is also one of the top risk factors of diabetes. Scientists at the University of Massachusetts Amherst found that people on a high-fiber diet were able to lose nearly as much weight as those on calorie-restricted diets. The high-fiber group lost 4.6 pounds after a year on average while those on the restrictive diet lost six pounds. The fiber diet has the distinct advantage of being simpler, more permissive and easier to maintain than a restrictive diet because it helps to reduce the temptation for unhealthy foods. 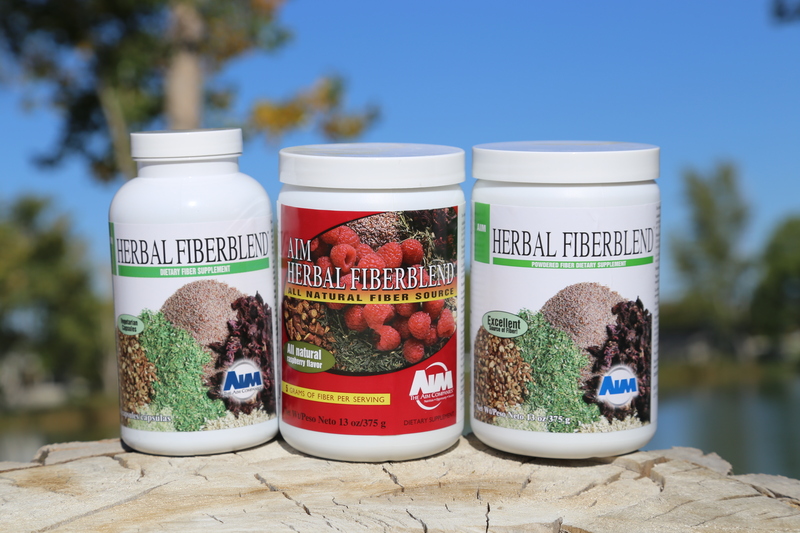 The AIM Companies provides two wonderful fiber choices in Herbal Fiberblend and fit ‘n fiber. 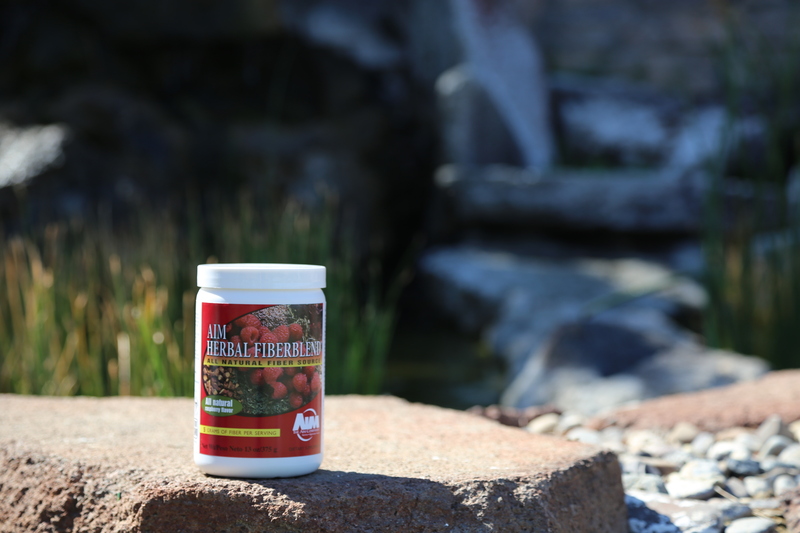 Herbal Fiberblend has been one of our top-selling products for years and years and contains 5 grams of fiber per serving. fit ‘n fiber is great in a smoothie and adds 7 grams of fiber. The average person only gets 15 grams of fiber per day. Adding these two products to your diet, will ensure you get the healthy, daily fiber that you need.